My flatmate almost worked here… the idea of two (or three) things on the menu perplexes me, but if you say it’s good, i believe you! SO glad you enjoyed this as much as I did. 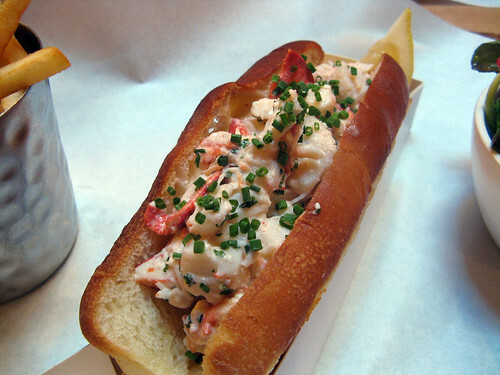 It could be a difficult sell, going for the lobster roll over the whole lobster because the lobsters they use for the roll are smaller and if your only concern is stuffing as much crustacean into your face as possible for the lowest price (like me) it’s tempting to go for the whole. But actually, as the pros are generally more efficient at extracting the meat, I reckon most of the time you end up with more meat in the roll. That’s not interesting, but it is true. I did ask the waitress if it was a whole lobster in the roll and she said that it wasn’t measured out ‘by lobster’ which is understandable as they must obviously have the mix ready. Still, a lorra lorra lobsta! I mean I’ve never been to a place with only three things on the menu, but it seems to work! Ah right I see. Well, give it a go! 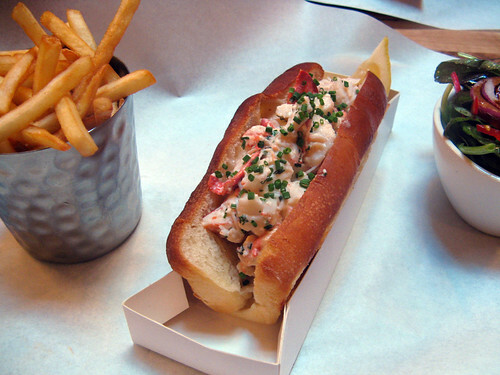 ooooh that lobster roll is a thing of beauty and joy; the only time I’ve had it I had eaten a whole lobster beforehand too. I don’t recommend this kind of gluttony. Apparently the mayo-dressed lobster is Maine-style whereas in Connecticut they dress the lobster with warm herbed butter. Oh man, I could’ve eaten a second roll, let alone just a second lobster! Can’t stop thinking about it. Hi, I read your review last night and had to go for an early lunch today! We had a roll and a whole grilled lobster which can be shared between two easily as they cut the sandwich in half and the lobster is split lengthways. Both were fantastic. The roll will haunt me for a long time. The whole grilled lobster with garlic butter won the day though because there was just so much more sweet, sweet meat. Fantastic value at £20.00 for a 1.5Lb – 2Lb creature. It’s such good value isn’t it? For a whole lobster in London, anyway. I’m so pleased you loved it. Had this a few weeks ago with a friend; it was very good, but not the perfect sandwich imo. My friend found the brioche very rich (as you say) and the the whole flavour was a little underwhelming after all the excellent reviews we’d read. £20 is a bargain for a whole lobster, but certainly not for this meal where you don’t get close to a whole lobster. I found the fries to be a little too fast-foody and the salad basic. I was bitterly disappointed when the waiter brought the whole lobsters to table next to us – I’ll be ordering that next time!